Scrying is known by many names such as seeing, crystal gazing and crystal seeing. It is a prominent tool used by practitioners all over the world for many purposes including finding lost items, peeking into past lives, and even glimpsing into the future. It is at its root, a Magickal technique that is used for the purpose of viewing images that will help the practitioner find clues leading to the answers they seek. Many people use this method in order to find out what may take place in times to come. The tools used for scrying vary widely, and are usually have a personal connection to the one using them. Some common examples of these are crystal balls, bowls of water, fire, panes of glass, or in some cases, a mirror. This technique is in fact used by people from all around the world, and it has been present in societies since before recorded history. Many different cultures have trusted methods for predicting the future, or to find out about events that have been occurring in the recent past or the present. Different cultures have different beliefs regarding the origin of the visions that come from scrying. Some believe that the visions come from their chosen deity or from a divine source. Others believe that the images come from ancestors who have passed beyond the veil of life. The variation is massive between world cultures, so it is clear that there will be a difference between the Siberian shaman and the European wise woman. Yet the concept behind the practice remains the same. The important thing to remember is that scrying is a window into what we usually cannot sense. It can show events related to the future, but also other events in the past or present that our normal senses can’t detect, such as events that are occurring far away. 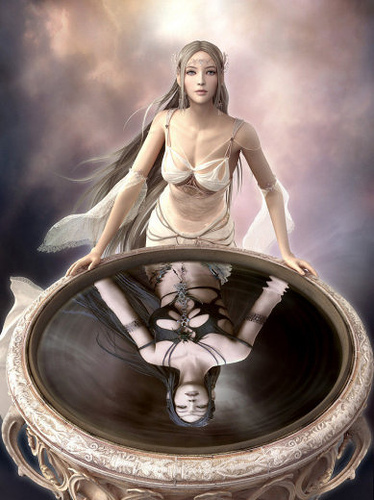 Most commonly in the West, people carry out scrying by making use of a crystal ball but there are also practitioners who make use of a reflective pond or a bowl of water for the purpose of divining the future. According to the tools used, the clarity and the type of visions that are received can vary greatly. If someone is using water as a tool to predict the future, then the visions obtained will come from the flow, ebb and color of the water. A skilled practitioner can read these. If the practitioner is using a reflective pond then the visions will come from the ripples of water or the shifting reflections from the depths of the body of water. On the other hand, if a fortune teller is making use of the atypical crystal ball, then the visions may come from the gloomy glow within the ball when it is under candlelight, from web-like faults or from dramatic images that momentarily reveal themselves. It is also important to understand that scrying is something that not every person can carry out without many years of practice and dedication to the art. This is because this technique requires the right skill level for the job. Ancient as well as present-day cultures respected those in society who possessed this skill, granting them the status of ‘elder’, ‘shaman’, ‘wise woman’, and other such titles. This points to the role that scrying plays in these societies. It is a way of seeing beyond that has cultural and societal value. The modern Magickal traditions, including those of our Coven, tap into this same well of inner vision. Often, a person can in fact test themselves for their scrying ability. It seems that the talent can appear in almost anyone, though it is rare without study of the technique. To become a skilled scryer, capable of viewing visions regularly and interpreting them correctly, takes an immense amount of practice and training. Again, we refer to the role that was passed down from master to apprentice in numerous societies. It is a skill that must be perfected to be of real use. Still, sudden visions in those who are unskilled are not unheard of. Perhaps you may have even experienced one of these isolated visions yourself? When it comes to scrying, the seer or the fortune teller often needs to concentrate very intently on the crystal ball or the medium that he or she is using for the purpose of sensing “beyond”. Until and unless the seer concentrates and can clear their minds, it will not be possible for them to read the future. It is an act that takes supreme focus but can yield truly startling results. Have you ever felt that you sensed something from the future? That you had a vision that foretold events that were yet to occur? Have you ever had a scrying experience yourself? i have secretly practiced and studied for years. I seem to posess a natural scrying ability without any tools. Usually silly little things like if a storm knocks the power out, I suggest aloud that it needs to come back on and it immediately does. This and other small things happen frequently but I'm not sure I'm in full control of my abilities. Would love to harness this gift.. I have tried over the last few years to scry, with only teasingly marginal success. The only time I know it worked, I wasn't even trying, nor did I know what actually did. People use everything from black mirrors to crystal balls.... Me, an old fashioned TV screen in the 70's. I was watching the tube after school at the ripe old age of 9, and I saw a ? vision ? that told me that my grandmother was about to pass. It actually appeared to be like a program on the device. It left behind feelings, impressions, understandings, and unbelievably, a rightness. For 40+ years I have been trying to understand why this happened. One thing I do know, it was a life changing experience. Sometimes I can tell a suitation is going to happen about 3 months before hand. It's a feeling I get as I past a place or talk to someone. I would love to learn more about this. 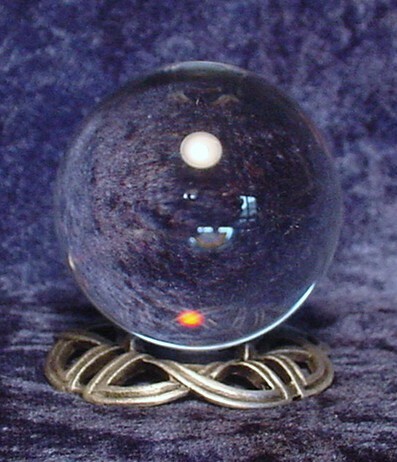 I have my crystal ball its usually on the table when I do my card readings for people which are really accurate. When it comes to scrying for those who wanna learn, it might be easier to start off with fire gazing. Which can be done with a flame as small as one on a candle or as big as the embers of a fire.. I seen my lil sis having a car accident on her was to work an I told her not to go to work in the morning cuz she would have a car accident an she didn't believe me an she did. She messed her car up pretty bad let alone she was shakin up somethin fierce. Just be careful an have all your protection set up..